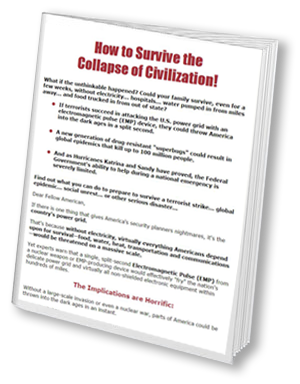 In this FREE report find out what to do if the unthinkable happens. Could your family survive, even for a few weeks, without electricity… hospitals… water pumped in from miles away… and food trucked in from out of state? Enter your first name and email address in the boxes below and then click “Get My Free Report” and you'll have instant access to your report, How to Survive the Collapse of Civilization. You will also begin receiving my Bob Livingston Alerts™ straight to your inbox. “Once it’s upon us, we can’t save you.” As Hurricanes Florence, Harvey and Maria proved, the government’s ability to help during a national emergency is limited. A new generation of drug-resistant "superbugs" could result in global epidemics that kill up to 100 million people. If North Korea succeeds in attacking the U.S. power grid with an electromagnetic pulse (EMP) device, they could throw America into the dark ages in a split second. How to survive a dirty bomb attack. Impossible? NO! The Pentagon has confirmed that the Islamic State—or ISIS—has been stockpiling radioactive and biological materials giving it everything it needs to create—and ultimately detonate—a so-called “dirty bomb.” Find out what to do to protect your family from dangerous radiation.